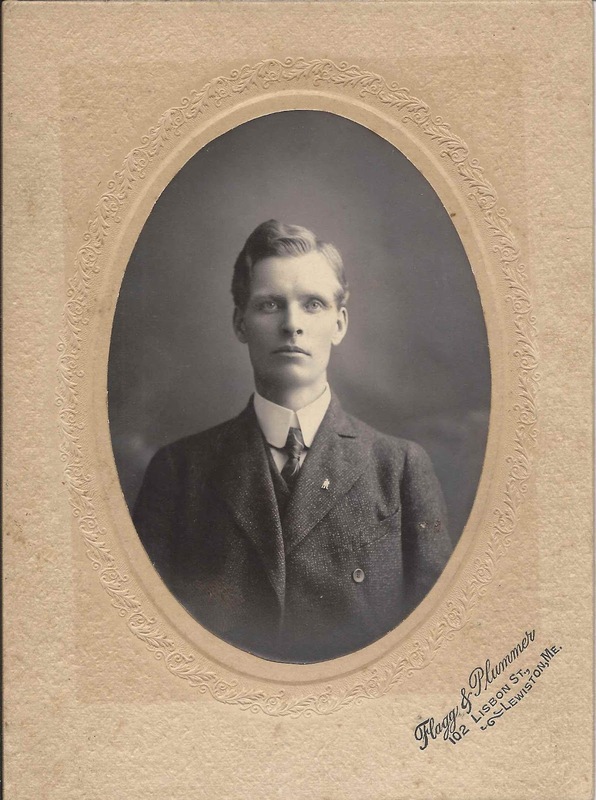 Photograph of a young man taken by the Flagg and Plummer studio of 102 Lisbon Street, Lewiston, Maine. 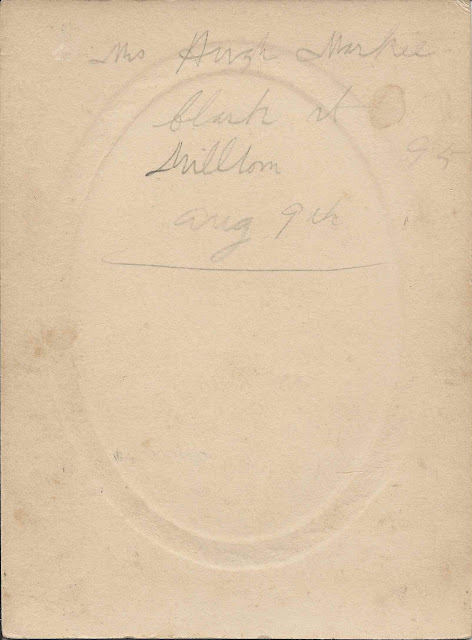 The reverse has information that this could perhaps be or be intended for Hugh Markie [perhaps Mrs. Hugh Markie] of Clark Street, Millton, or Milton, or Milltown. Perhaps I've deciphered Hugh and/or Markie in error. Readers' interpretations are most welcome! The photograph was purchased at Calais, Maine, which has a section known as Milltown, and, even better, a Clark Street in that area. The section across the St. Croix River from the Milltown area of Calais is called Milltown as well, part of the city of St. Stephen, New Brunswick. There's a Clark Street in St. Stephen, but it's not in the Milltown section from what I could tell. 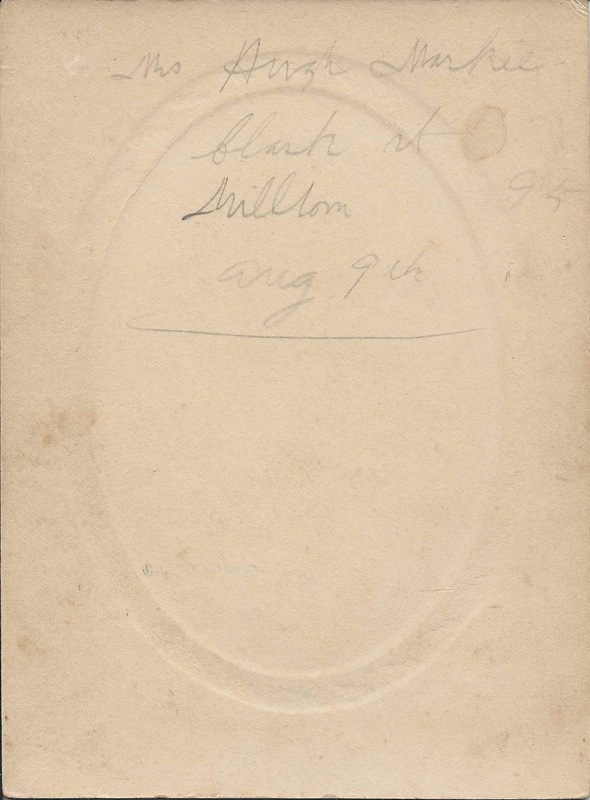 However, what is written on the reverse of the photograph may not be Milltown. The name looks like Mrs. Hugh Markie, so the name may not identify the young man, but rather a relative or friend to whom the photograph was directed. Or the "Mrs." could be "Mr."
From researching online, I can see that both the Lewiston, Maine area and the Calais, Maine area had members of the Markie family living there. The antique dealer who sold the photograph indicated that he associated the Markie name with New Brunswick, Canada, in case that's a clue. The young man may have been a student at Bates College, which is located at Lewiston, Maine. If you recognize him from your family albums or if you have a theory as to his identity, please leave a comment or contact me directly.